Day Lily Roots, Tubers, Bulbs (year round) - $10.00/lb, plus shipping. Leaves available in the spring time also. 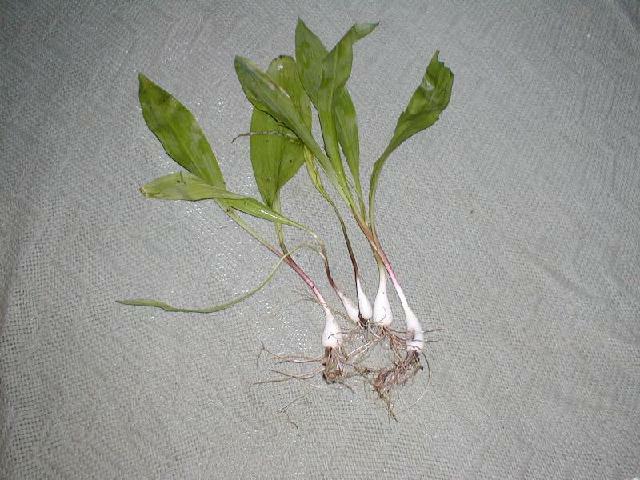 Ramps (Wild Leeks) - Allium tricoccum - available in March or April. Please email to get on wait list for this item as it sells out very fast. Southerners call them "ramps" and Northerners call them "wild leeks." Basically they are they same plant. Fresh ramps (bulbs and leaves) are usually available in April and May in our area. All fresh roots are pre-order only as the season changes from year to year. If you want a particular item, please email and we will advise when the order can be available. Minimum order is 1 lb., perishable item must ship Priority or overnight. If you live in the mid-west or the western U.S. it will take the post office at least 4 to 5 days do deliver and most likely the tops will be of no use. Deliveries to the eastern states are ok. Please email your address and/or zip code and we can advise shipping costs. USPS Priority is usually sufficient unless you live in the mid-west or west coast. UPS/Fedex two day ground is recommended. There is an additional cost of $20.00 for Fedex or UPS to pick up orders or for us to drive to their drop off location which is an 80 mile trip for us. Price went up in 2014 because of the high cost of gasoline and the remote areas where these wild plants are found. You can find them cheaper on other sites, but they are most likely commercially grown and not wild harvested. Crunchy, sweet taste - Eat raw or cooked. "Edible Parts: Flowers; Leaves; Root. Leaves and young shoots - cooked. An asparagus or celery substitute. An excellent sweet tasting vegetable though some caution is recommended. The leaves need to be eaten while still very young since they quickly become fibrous. Flowers - raw or cooked. The petals are thick and crunchy, making very pleasant eating raw, with a nice sweetness at the base because of the nectar. The flowers can also be dried and used as a thickener in soups etc. In this case, they are picked when somewhat withered and closed. A rich source of iron. Flower buds - raw or cooked. A pea-like flavor. Can be dried and used as a relish. The dried flower contains about 9.3% protein. 25% fat, 60% carbohydrate (rich in sugar), 0.9% ash. It is rich in vitamin A. Tubers - raw or cooked. A nutty flavour. Young tubers are best, though the central portion of older tubers is also good." Old Saying: "Some people boil wild onions in three waters and then throw them all away, including the onions." Wild onion (A. validum or A. canadense) is a bulbous herb of the Amaryllis family and is a close relative of cultivated onion (Allium cepa L.). It has a distinct onion odor. It has slender grass-like leaves and reaches about 2 feet in height when flowers appear in late summer. Leaves are narrow, long, and with parallel edges arising from the small underground bulb. Flowers, varying in color, depending on the species, from white to pink, appear at the top of a leafless stem and eventually become bulblets which drop to the ground and propagate. These tubers are being used to reduce blood sugar levels in diabetics. Jerusalem artichokes or sunchokes are not only good for you, they also make great pickles. Plan ahead to make these at least a week before consuming. Peel and cut the Jerusalem artichokes into 1/2-inch chunks and drop into water acidulated with lemon juice. Cut up the head of cauliflower, break flowerets into 1/2-inch pieces, and peel and cut the stems into 1/2-inch cubes. Crisp the vegetables in a brine solution made this way: Cover the chokes and cauliflower with water to see how much water you need, then drain the vegetables, saving the water, and mix into it 1/3 cup pickling salt per quart. Place the vegetables in this brine and soak for 24 hours. Combine the vinegars, water, sugar, celery seeds, turmeric, mustard seeds, and dry mustard in a stainless steel or enameled saucepan and bring to a boil. Stir to dissolve sugar, reduce heat, and let simmer for 3 minutes. Remove from heat. While the brine is simmering, coarsely chop the peppers and onion. Drain the chokes and cauliflower, rinse them well to remove salt, and drain again. Combine chokes, cauliflower, peppers, and onion and pack into clean hot jars, following manufacturer's directions. Ladle in hot brine, a bit at a time, making sure it runs through the vegetables. (Putting a long, sterilized skewer in the jar and moving it around helps the syrup flow through the vegetables.) Fill to 1/8 inch of the jar top, seal, and process in a hot water bath for 10 minutes. Set pickles in a cool place for at least 1 week before serving. "The main ingredient in this relish is Jerusalem artichokes, which are actually a kind of tuber. 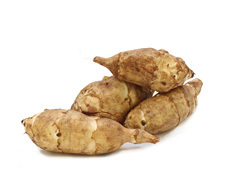 They are also known as "sunchokes" or topinambours in France. This is a delicious relish which goes particularly well with sausages or hot dogs, but is good with all meats and cheeses. The Jerusalem artichokes have a nice crunch, which is retained in the finished relish. You may notice that this recipe makes a lot of relish. Most people who make this give it as a Christmas gift, so they make a lot so they have enough for their family and enough to give away. You can halve the recipe if you don't think your demand for artichoke relish will be quite that high. The preparation time listed includes the time spent soaking the vegetables overnight." You will need 2 large stainless steel pots or very large plastic bowls to soak the vegetables. They must be large enough to hold one gallon of water each, plus 6 pounds of vegetables (chopped) each. DO NOT use aluminum; the vinegar will react with it. First you have to clean the artichokes. They are pretty knobby, and they collect a lot of dirt and grit. Put the artichokes in a large pot and cover with water. Scrub each artichoke thoroughly with a stiff vegetable brush, and run it under some water. If grit seems to be trapped between the artichoke and its "fingers", you may have to pop them off to get the grit out. Make a brine out of ONE of the cups of salt, one gallon of water, and the 4 tablespoons of white vinegar. Stir well to make sure all the salt is dissolved. Prepare the artichokes: do not peel the artichokes - the peel is edible and you will lose a lot of vitamins, plus these things are really knobby and if you try to peel 6 pounds of them I assure you you will lose your enthusiasm for making this relish. Chopping: you have two choices here. I prefer to cut the artichokes into quarter inch dice by hand. Other folks use a food processor. The reason I don't use a food processor is because Jerusalem artichokes have a unique consistency, and they don't chop well in the food processor. Some of them get pulverized, while large chunks remain un-chopped. So, if you like, use a food processor, but just make sure you don't end up with mush. You want a lot of very small chunks; it should look about the consistency of relish. As you cut the artichokes, place them in the brine. Make a second batch of brine with the remaining cup of salt and one gallon water, stirring well to make sure all the salt dissolves. In a food processor, chop the cabbage, onions, and bell peppers until they are cut fine. Make sure to keep an eye on what you are doing so you don't get mush. You want the vegetables to be the consistency of a relish. Once they are chopped, place the vegetables in the second batch of brine you made, and stir well. Cover both bowls of brined vegetables, and leave on the counter overnight or for 8 hours. Don't let them sit in the brine for longer than 10 hours or the vegetables may become too salty. Line a counter with lots of paper towels - I usually use 5 layers. You are going to be placing the drained vegetables on these paper towels, so make sure you cover a fairly large space; at least 2 1/2 feet by 1 1/2 feet. Drain the Jerusalem artichokes and rinse with cold water. Drain well and place on half of the paper towels. Drain the cabbage/onion/pepper mixture and rinse with cold water. Drain well, and then with your hands, which you have just washed in hot water with soap, squeeze the remaining moisture out of the vegetables. You will see that a lot of water still comes out. Place the drained and squeezed vegetables on the other half of the paper towels. In a large bowl, whisk together the French's mustard and the flour. Set aside. In a very large stockpot (at least 10 quarts), combine the apple cider vinegar, white wine vinegar, sugar, yellow mustard seed, turmeric, celery seed, cayenne pepper, ground allspice, ground cloves, and black pepper. Bring to a boil, stirring well, and then reduce to a simmer. Dip out about 2 cups of the vinegar mixture and add it to the mustard/flour mixture in the bowl, whisking well to combine - make sure you whisk it until there are no more lumps. Add the mustard/flour mixture back to the vinegar mixture in the stockpot, whisking well to combine. Bring to a boil and then let simmer for 10 minutes over medium heat, whisking occasionally. Add the drained artichokes and the cabbage/onion/pepper mixture, and stir very well, making sure all is combined and mixed well with the vinegar/mustard mixture. Bring to a boil, stirring often. Place in canning jars, leaving 1/2" headspace. Use a chopstick or other thin, non-metal utensil to run around the sides of the jar to make sure there are no air bubbles left in the jar. Wipe the rims of the jars with damp paper towels to remove any relish which got on the rims or the threads. Place the lids and the bands on the jars, just tightening the bands fingertip tight. Process in a boiling water bath for 15 minutes, then remove and let sit, undisturbed, for at least 12 hours before checking seals. It is important to let them sit undisturbed for 12 hours because the sealing compound on the lids is still cooling and hardening, completing the seal. While the jars cool, you will hear a "plink" type sound from each jar - this is the jars completing the vacuum seal as the final air escapes the jar. After 12 hours have passed, remove the bands and check the lids - press down in the center of the lid. If you cannot push the lid down any further, the jar is sealed. If the lid "gives" a bit, and you can push it down, the jar did not seal. You can either put the band back on the jar, and reprocess it for another 15 minutes, or you can just put it in the fridge and use it within 3 months. Artichoke relish should sit for at least a month before you use it, so the flavors can combine and improve.